A new book by the excellent Peter Grant. I hear this one is dedicated to Sarah A. Hoyt! 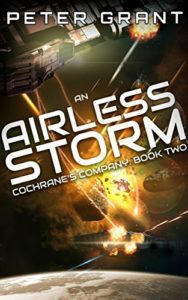 Andrew Cochrane and his mercenaries have warded off a deadly onslaught by asteroid thieves. Now they’re riding high, buying more ships and looking for more contracts. However, the criminal Brotherhood isn’t about to accept defeat – not after Cochrane’s Company killed their Patriarch. They’re out to rebuild, rearm, and get revenge.